I found these on Allrecipes.com here. I made them and they were fun to look at and to make. But they weren't necessarily that tasty. Just when I was having fun. I remembered my grandson couldn't eat cream cheese. Set a big olive, large hole side down, onto a carrot slice. 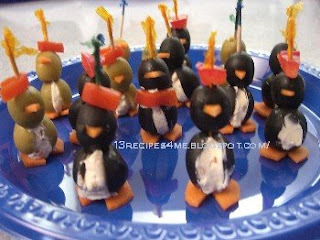 Then, set a small olive onto the large olive, adjusting so that the beak, cream cheese chest and notch in the carrot slice line up. Secure with a toothpick. (I copied the direction straight from the above website.) We played around with green olives.